Arab leaders have concluded their annual summit by showing their support for Sudanese President Omar al-Bashir who is wanted for war crimes. The Arab League said it rejected the International Criminal Court's decision to issue a warrant for his arrest. 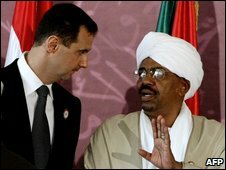 President Bashir had earlier spoken at the summit in Qatar, and won strong support from his Syrian counterpart Bashar al-Assad. They were among 17 heads of state in Qatar, but some seats remained empty. The most notable absentee was President Hosni Mubarak of Egypt. Correspondents say he is unhappy with Qatar's stance during the recent Gaza conflict. Meanwhile, the BBC's Katya Adler, in Qatar, says earlier reports that Libyan leader Muammar Gaddafi had stormed out of the Arab League summit were incorrect. But, our correspondent says, Mr Gaddafi used the floor to settle old scores, criticising Saudi King Abdullah and appearing to reignite a public spat he had at the 2003 Arab summit. At Monday's opening session he called the king a British product and an American ally. But he added that he now considered their "problem" over and was ready to reconcile, drawing applause from the other delegates. The two leaders appeared to bury the hatchet with a 30 minute face-to-face meeting on the sidelines of the summit, reports said. At the end of the summit a joint statement by the Arab League said: "We stress our solidarity with Sudan and our rejection of the ICC (International Criminal Court) decision." Earlier in the day, Syrian President Assad said those who had "committed massacres and atrocities in Palestine, Iraq and Lebanon" should be arrested first. Many African states, along with Sudan's key ally China, have called for the ICC proceedings to be suspended, arguing they will hamper efforts to bring peace to Darfur. President Bashir attended the summit to thank the leaders for their support. Qatar has not signed the ICC charter, which obliges a member state to arrest those indicted by the court when they enter its territory. In his opening remarks, Syria's President Assad also spoke about Israel - saying the Arab world had no "real partner in the peace process". He said this had been demonstrated by the recent Israeli election, with Benjamin Netanyahu due to become prime minister at the head of a right-wing coalition.